IN THE LIGHT OF LED ZEPPELIN – Winter Garden, FL – MAY 31, 2019 | Love Productions Inc. 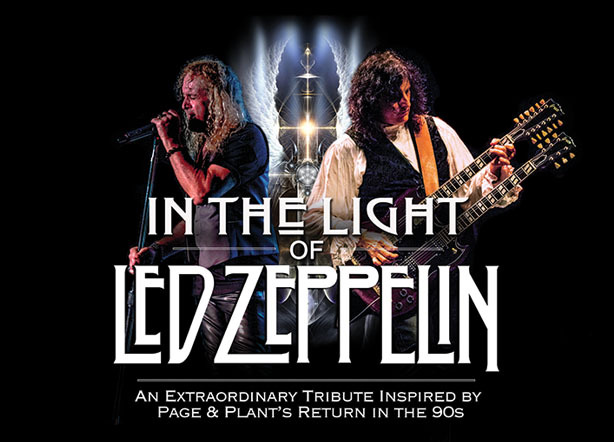 Inspired by the musical evolution of both Jimmy Page & Robert Plant, In The Light of Led Zeppelin is bringing audiences the new musical and visual interpretation of the Led Zeppelin Experience the same way Page and Plant presented it in 1994 through 1998. A genre-bending, chance-taking project, the music is performed with the same attention to detail using authentic instrumentation. This extraordinary, highly refined tribute ensemble digs deeper into the Middle Eastern and classical influences that permeated “Kashmir” — and then follows that intriguing thread into brand-new sounds when performing the classics, providing a unique, not-to- be-missed musical experience, from the hard-rocking Zeppelin classics to the acoustic masterpieces. It is a powerful and exciting show that you will want to see time and time again. Performed by an all Star Grammy nominated cast. In The Light features: Electric and Acoustic guitars, Sitars, Pedal Steel Guitar, Thermin, Mandolin, Electric Bass, Acoustic Bass, Standup Bass, Drums, Percussion, Keyboards, Piano, Hammond Organ, Electric 6 string Violin, Electric 5 String Violin, Electric & Acoustic 4 String Violin. All of the original amplification including the early 70’s amplification used on all Led Zeppelin recordings and concert events — all necessary for recreating this most beautiful music.